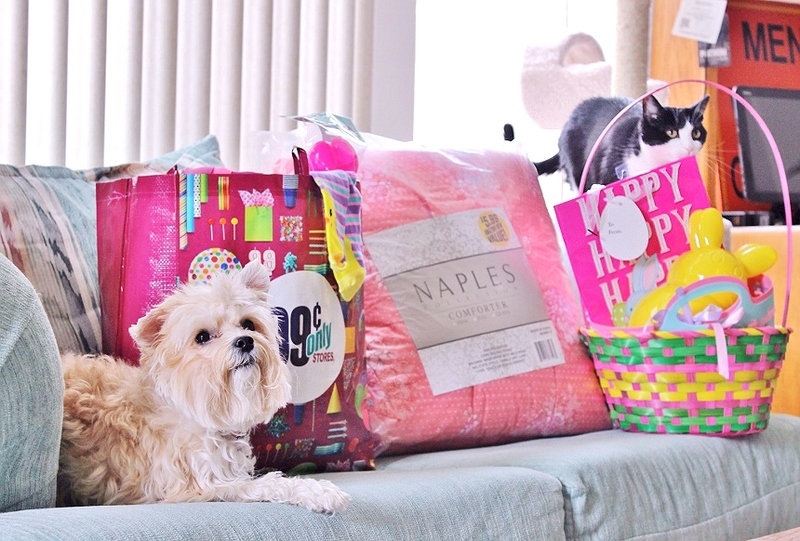 Momma Told Me: Affordable Ways To Celebrate Easter With Pets: $5 D.I.Y Teepee, $3 Dog Toys, + More! 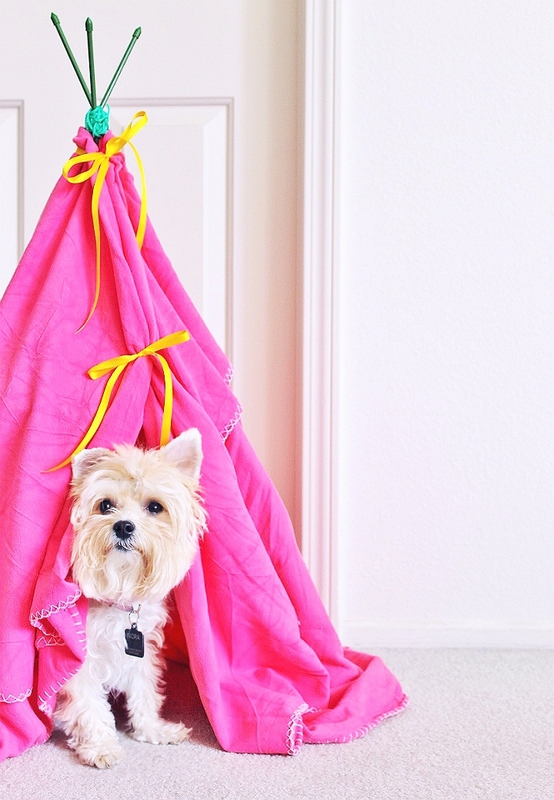 Affordable Ways To Celebrate Easter With Pets: $5 D.I.Y Teepee, $3 Dog Toys, + More! Momma Told Me: Why spend more when you can spend less? If you've been reading Momma Told Me for a while then you know all about Momma's frugal side. How all of my clothing growing up was from the second hand store, every Summer I'd practice mathematics calculating coupon and sale prices, and that the large majority of our gifts were often handmade. The older I grew, the more I'd contemplate this need to save when our family had no seeming need to be quite so frugal. After all we lived in a nice home with new electronics, and our kitchen had the fanciest gadgets and gizmos. That's not to say my father didn't work hard, and very long hours, to support our family- but we surely were not living meal to meal. The holidays were where I always seemed to feel this frugality the most. If I wanted to have a My Little Pony birthday party it would instead have to be a 'My Friend Pony' party because Momma wasn't about to pay triple the price for the same cartoon horses, just with different names. One holiday season, as I clung to one of the hottest toys of the season, full on melt-down mid-store, I at last let out a scream of frustration, "Why can't we buy the 'good stuff'? It's not like we're poor!" Naturally, being the sort of parent she was, Momma shut the tantrum down promptly, pulling the item from my hand and slapping my wrist as she answered rather calmly, "Because, daughter, you can buy the same exact thing, with a different name, for half the price. Why spend more, when you can spend less?" Naturally that was the beginning of my own monetary awakening. I remember suddenly becoming fascinated by the concept of 'after market,' 'off brand' and even 'overstock' merchandise. Instead of gift cards for major retailers I'd ask instead for cash whenever my birthday came around so I could buy exactly what I wanted, at the best price. Of course, today, being money smart doesn't mean you have to make compromises. In fact, smart shoppers can save plenty over retail pricing on name brands and products they use every day when they make smart retailer choices. That's exactly why I'm a 99er. Not only are there several 99 Cents Only Stores in my hometown, but their wide range of inventory covers everything from fresh produce to bedding and pet supplies. Even better, their stock is always changing as new items hit the shelves, so I know I'm in for some amazingly fun shopping whenever I visit! With this being our first year in our house (rather than a condo), I'm extremely excited about the prospect of decorating for, and celebrating, each of the year's holidays. 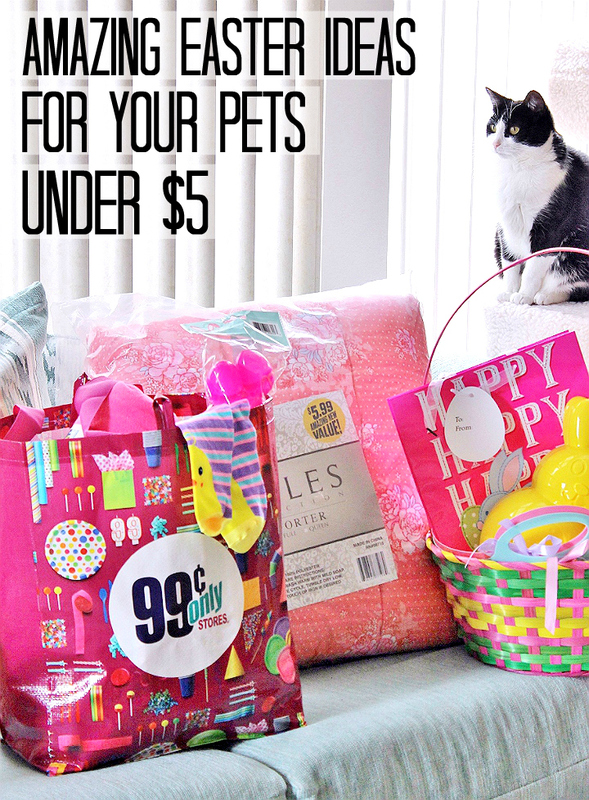 Easter is no exception, and I know I can stretch my budget on everything from delicious treats to adorable decor, and even gifts when I shop my local 99 Cents Only Store. 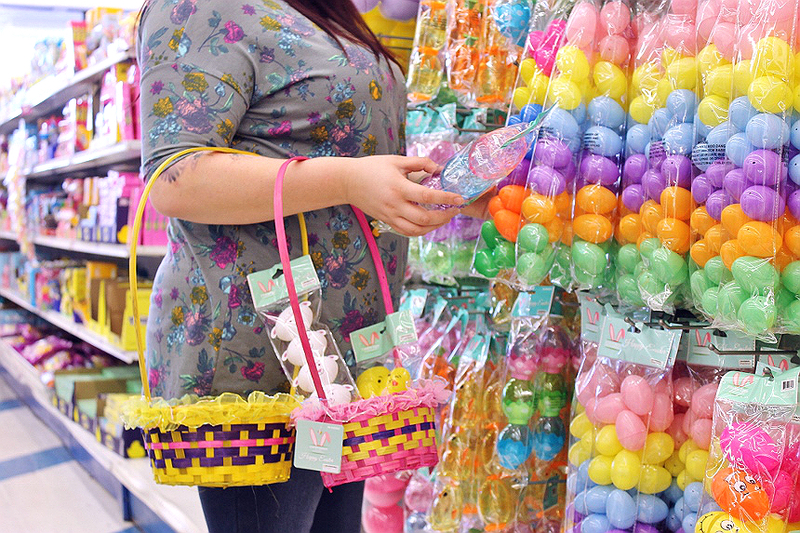 With an entire aisle dedicated to Easter, I practically feel like a kid in a candy store loading up my cart! While I won't be planning any parties for the Spring holiday this year, I've decided to celebrate everything rainbow egg and bunnies with my furry family- the pets. As always, the holidays also bring plenty of yummy treats for the humans, many of which you'll also find at the 99. Be sure to check out The Goody Pet's article "Top 27 Foods That Are Dangerous To Dogs" before planning your next big holiday event! I remember when I first brought Truffles, our cat, home as a kitten it was just over a week before Easter. At the time I was renting a room out to a woman with a young child and there were little plastic eggs strewn all over the house from the little one's play time. Truffles, being the kitten she was, instantly took to swatting them here and there- and even hiding them under pretty much everything in the house. 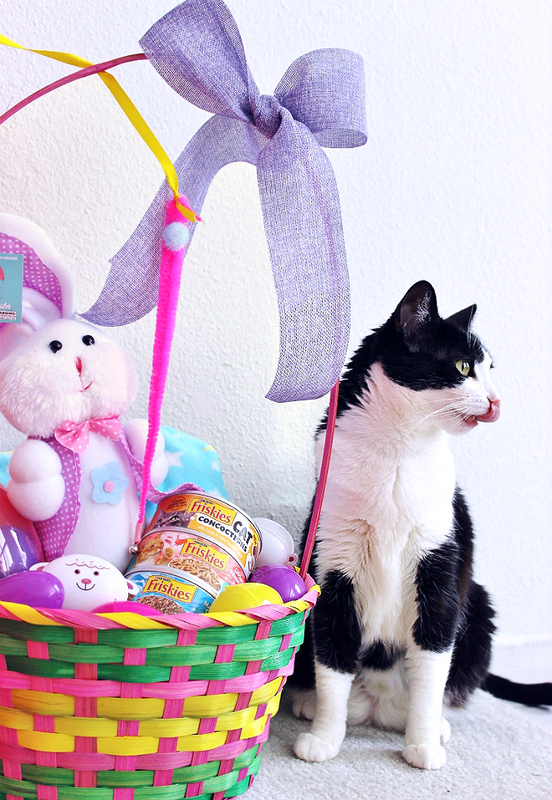 Ever since I've made a point to go shopping for 'the cat's' Easter eggs each year during this holiday. To say that I was overwhelmed by the selection at my local 99 would be an understatement. There were well over 30 styles of Easter eggs to shop from; emoji faces, sheep, carrot shaped, and even jumbo eggs! I went way overboard, for someone shopping for their pets, and spent a whopping $30. I'm a bit embarrassed, really, because I bought way more than we needed- but I just had to have a variety of Easter eggs and baskets to choose from when building my Easter baskets for the pets. It's not the end of the world, really, because the leftovers will go into little treats and surprises for the kids at the daycare- 99 Cents Only Stores are a life-saver when it comes to celebrating the holidays with 10 children! While I love snagging my Cadbury Eggs and Reeses Eggs from the 99, sometimes the real fun in holiday shopping at the 99 is D.I.Y inspiration. I found plenty of Spring prints and themed items on my shopping trip I found I could easily transform into special handmade pet toys to help fill my unique Easter baskets. 1. Lay your swaddle cloth out, print side down, and place a tennis ball in the middle. 2. Cut diagonally from each corner into the center (towards the ball), leaving about 1" uncut fabric to the tennis ball. 3. Take 2 diagonal corners and tie them across the top of the tennis ball. Repeat with the remaining corners. 4. You should have 4 sectioned corners of fabric. Starting with 1 corner cut the fabric into 6 even width strips. Your lengths will not be the same, this is fine, you can trim when you are done braiding. Be careful with your cuts not to overlap and cut any fabric off. 5. Take 3 of the fabric strips and braid until you've reached the end of the shortest strip, tie a knot and trim any excess, leaving at least 1" of fabric from your securing knot. 6. Repeat with the remaining 3 strips. Repeat steps 4-6 until all corners are braided with 2 braids each for a total of 8 braids. Don't worry if your braids are different thicknesses or lengths- your dog will enjoy playing with each end uniquely! If you have a larger breed dog then you may wish to make thicker braids by doubling up each length of fabric, or by using a fleece fabric braid to add thickness. Nora is a small breed dog, but she absolutely loves 'tearing' into these 'octopus' style braided toys and plays for hours with them on their own. Best of all, you can recycle the tennis ball inside if the fabric ever becomes torn or too dirty! 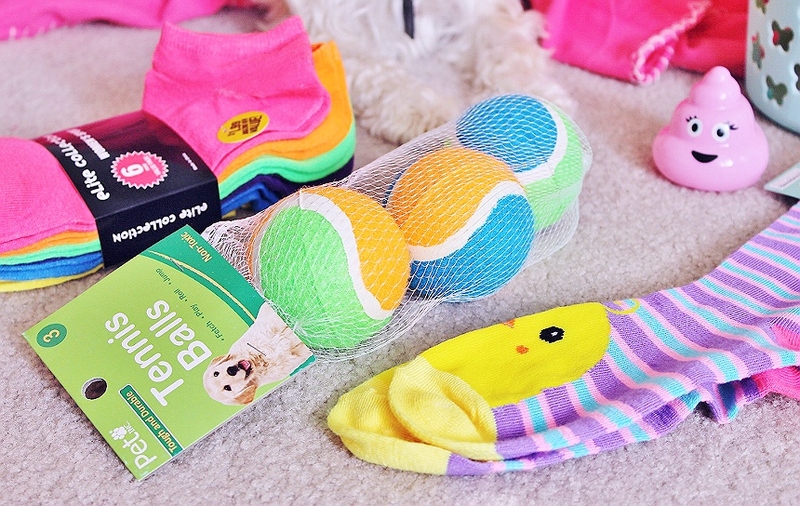 For those looking for an even simpler DIY dog toy- look no further than the classic 'Tennis Ball Sock.' 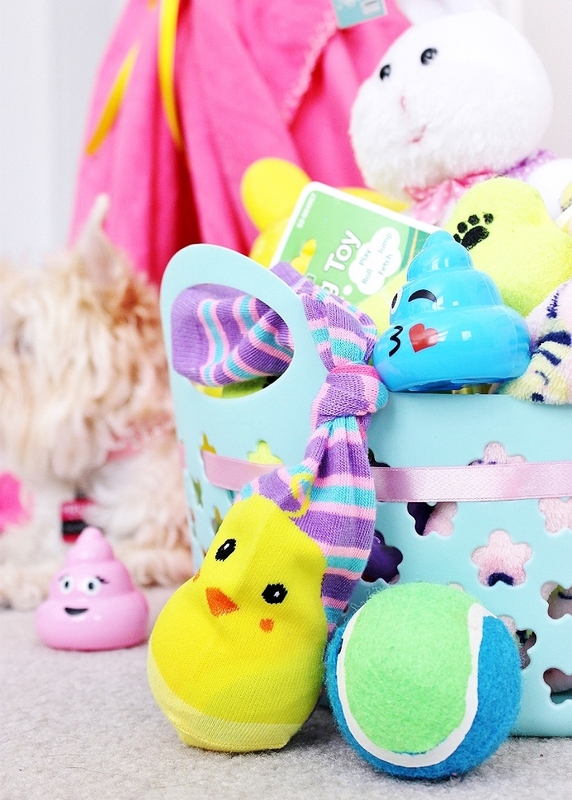 We found some adorable pairs of Easter socks perfect for our Easter basket. Because socks come in pairs of 2, and the tennis balls came in packs of 3, we made 2 toys for just $2, with a tennis ball to spare! It's as easy as placing a tennis ball in your favorite festive sock and tying it off with a knot. Viola! 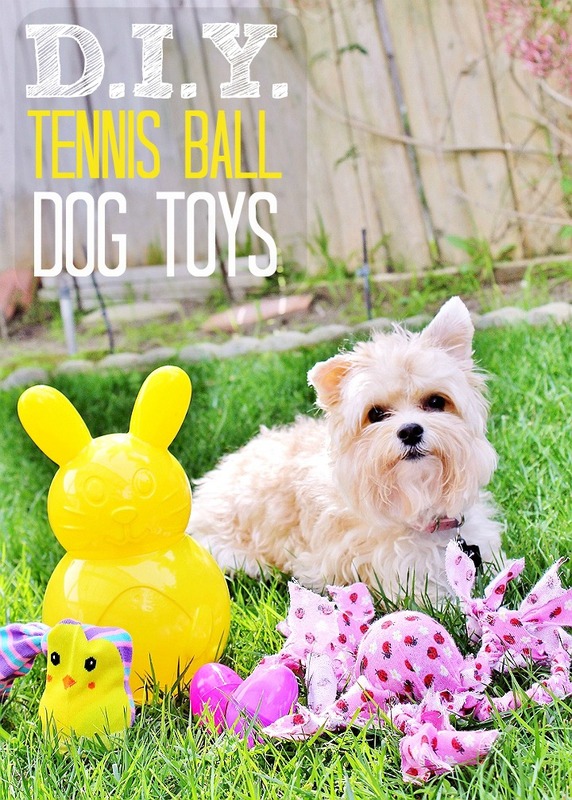 You'll find similar Easter toys at the local pet store for up to 5X as much! 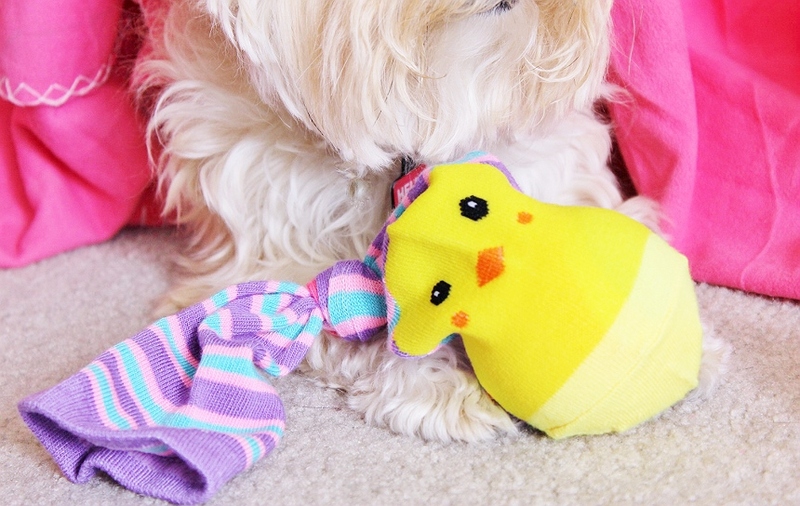 I cannot get over how adorable my 1 minute tennis ball sock toy chickadee looks next to Nora's Easter basket. And how about those 'poo emoji' themed Easter eggs? Aren't those perfect for any posh pup? In addition to her handmade toys we also added some dog toys we found in the 99's pet aisle, a few rawhide style treats, and a new blanket (just $2 hanging on the wall with the baby gear). Naturally we didn't forget about Truffles, the cat- it just so happens my local 99 had their spring gardening supplies set up on the other half of the Easter aisle. 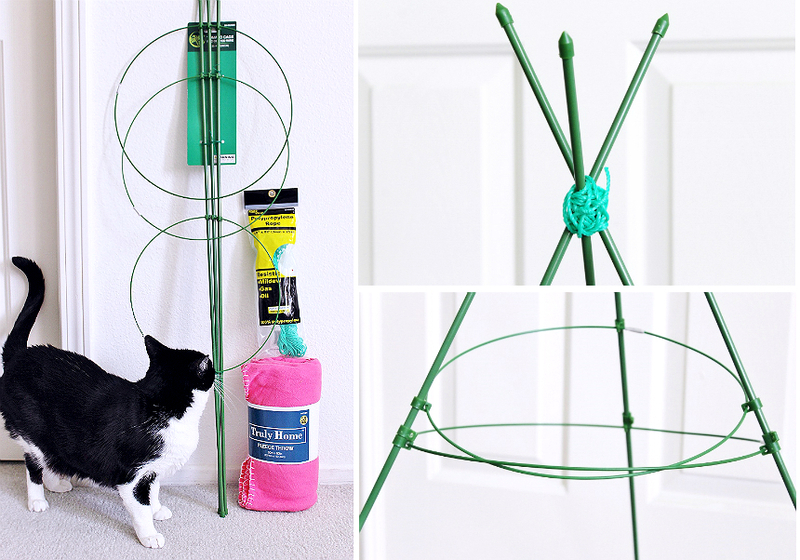 In a stroke of genius I spotted some tomato plant cages for $.99 I could easily transform into some amazing cat DIY staples! In fact, there happened to be multiple sizes of tomato plant cages and the small size prided 3 poles that were the perfect length for a cat wand! After cutting (regular scissors work fine) off the lightweight plastic clips holding the round cage guides in place I discovered that the plastic caps on either end of the support poles actually popped on and off with a little effort. 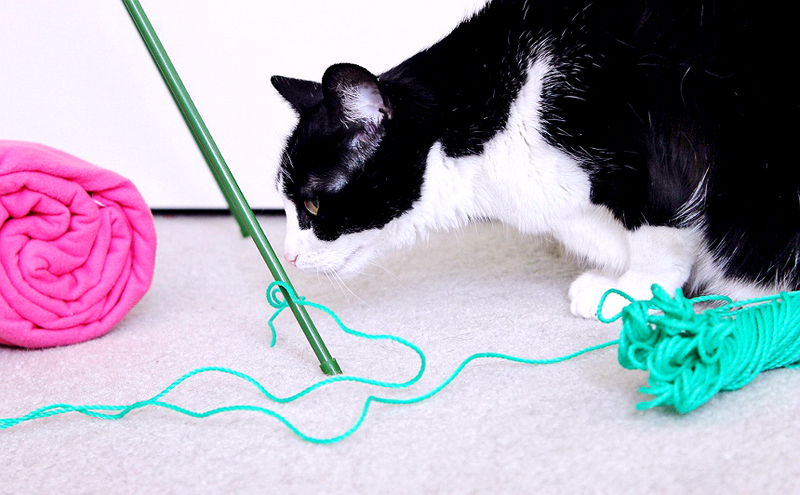 Using some ribbon I'd found in the Easter aisle and a cat toy from the pet aisle I actually tied the ribbon to the toy and fed 2" of the opposite end of the ribbon into the hollow pole. With a quick 'pop' I snapped the cap back in place and had an instant cat wand! Naturally one could duct tape or glue the cap on if they were concerned about cat's chewing or playing rough, and handmade 'lure' toys could be made out of multiple ribbons, pom poms, or more! I won't lie- Since each tomato cage makes 3 cat wands I plan on playing with a bunch of different 'lures'. 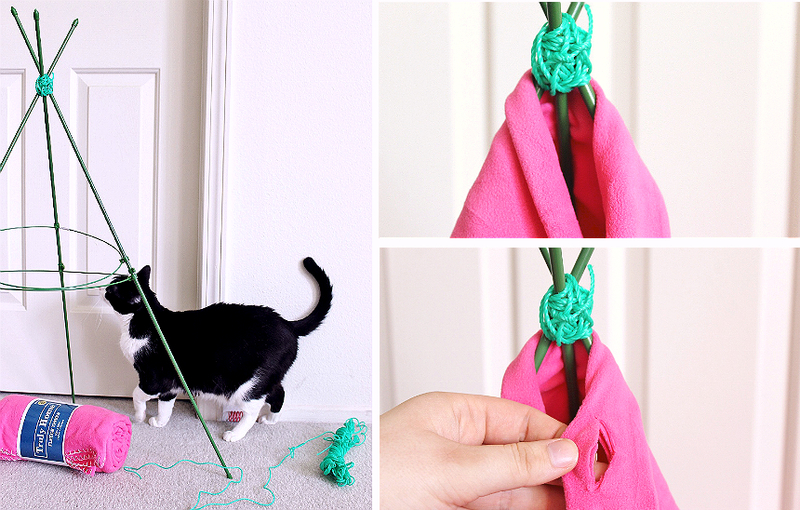 We'll have a whole umbrella stand full of handmade cat wands soon enough. 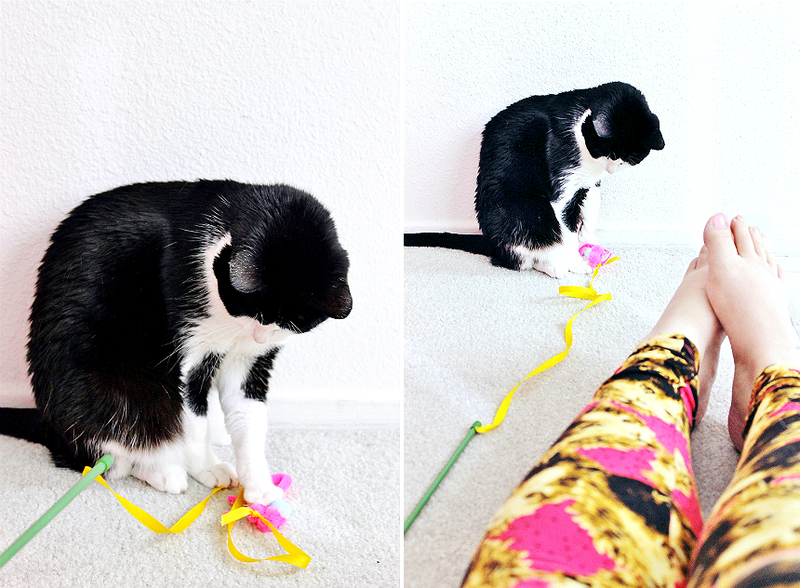 Truffles might be a 'senior' cat at 7, but she's still just as fascinated with ribbons and wands as ever! I originally put my completed wand in her Easter basket and had to hide it in the broom closet after finding it in the middle of the living room floor for the 3rd time. Some kids just can't wait for the holiday to unpack their goodies! To complete my Easter display I knew I wanted to make a kitty teepee at long last. I'd seen hundreds on Pinterest and, for a while, before finding the tomato cages I'd pondered using the poles from some yard rakes to accomplish this. At 3 rakes for $.1.99 a piece I'd be hard pressed to find my materials much cheaper elsewhere, but the large tomato cage was just $.99. Even better the tomato cage naturally formed a teepee like structure when I manipulated it's posts- perfect for someone structurally challenged, like me. If you've ever wanted to make your pet a teepee but found the concept of a free standing structure intimidating, this is your teepee. Head to your local 99 Cents Only Store and purchase a large tomato plant cage, fleece blanket, polypropylene rope (or any type of heavy duty string/rope), and some ribbon and make this teepee for just $5 in 5 minutes. It's as easy as cutting the lowest supporting rung off (the plastic clips will snip easily with basic scissors), manipulating the top ring at an angle into the middle ring, and evening your posts to the same height at the top. Once you've got your tomato cage in a general shape go ahead and take your rope/cord/string and tie it around the 3 posts at the top. Use your excess string/rope/cord to weave in and out, and around the top posts multiple times until the structure holds on it's own. You should be able to adjust the length of the posts with a little force as needed. Next drape your blanket over the structure and cut 2 horizontal slits approximately 1" from the edge, and 6" down from the top of your teepee. 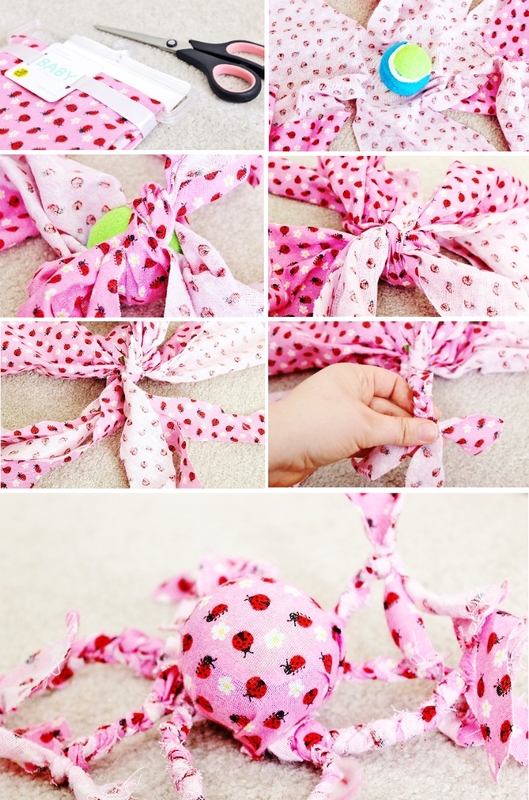 Run your ribbon of choice through it and tie in a bow to secure the teepee's fabric. Repeat about 6" down from the first bow. Place a pet bed inside, or leave as is for young children to use with dolls and such. Scroll to the bottom of this post to grab the PINterest strip! While any of these D.I.Y ideas can be used to make special gifts for your pets during any time of the year I especially love that I can afford holiday themed toys without the prices of seasonal merchandise. I made all of these awesome Spring and Easter themed pet toys for the cost of one small sized pink squirrel with an Easter egg squeaker at my local pet store. 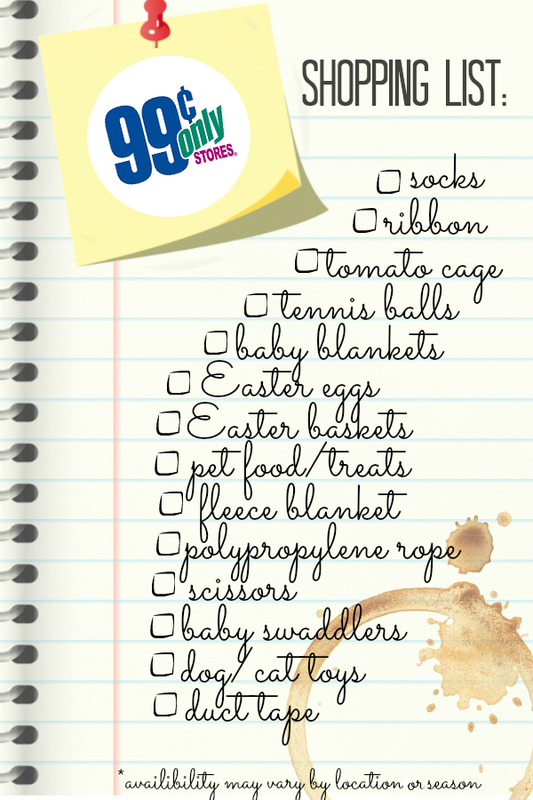 I've listed all the supplies I used to prepare for a magical Easter with my pets above, and every single thing I used was purchased at my local 99 Cents Only Stores. I even nabbed new bedding for the dog with a $5.99 comforter score! 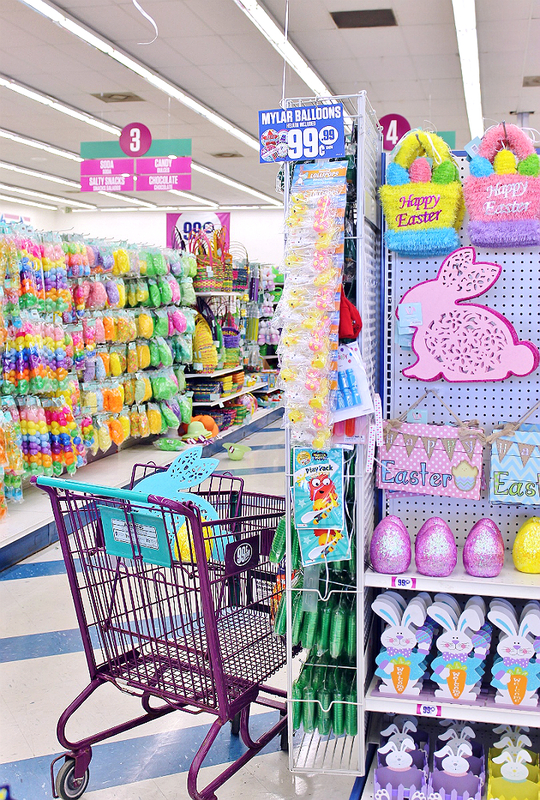 Don't wait to head into your local 99 Cents Only Store to shop for Easter- the seasonal aisle is full now, and be sure to visit again before the holiday as new products are always being added. I know I'll be heading in a few times to keep collecting items for Easter baskets for the daycare kids, and my bowling league. Sure, it may seem a bit over the top to be 'that person' who always has something small to give everyone in celebration of a holiday, but I rather enjoy being able to afford that, thanks to the 99. Don't have any fur children like me? Just think how adorable an Easter basket would be tucked into one of those DIY teepees for a young girl or boy on Easter morning! Still need more inspiration to 99? Check out this fun video and follow the brand on Instagram! What Daughter Says: Why spend more when you can spend less, indeed! 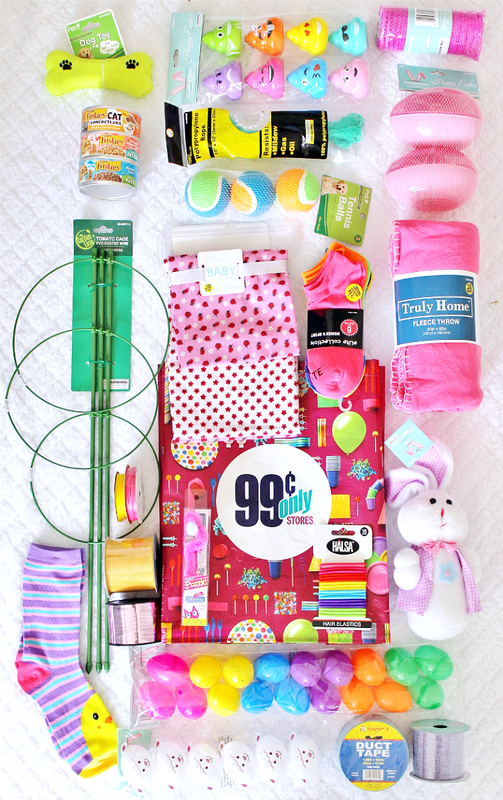 My local 99 Cents Only Stores have my favorite brands, and new discoveries, at prices that make it fun to shop again! You always have the cutest pet related posts! Our dog Chloe isn't a bed person and prefers to just lay on the carpet or tile to sleep.However, she DOES love to be covered by blankets. I think she would adore her own little teepee. That thing is just too adorable. These are such cute ideas! Our dogs and cat will love these! Some cute ideas here! I was raised the same as you, as well - why pay twice the price for a brand name product? So glad to find someone as gag over their pets as I am. I am soooooo gonna be making a teepee for my Pug, Gung Poe Wigglebutt. He is going to LOVE it! I HAVE to see Gung Po in his teepee, I bet he will be adorable! So cute! I made dog toys once and spent way too much time and money. This looks like the perfect way to make some fun without going overboard. What fun ideas! Our kitties would love a new cat wand to play with! So many great ideas. I love how vibrant they are. :) great instructions too. THe teepee is a scream. Did Truffles try to knock it down? Your instore shots really help me understand the inventory in the store. Shocked at what I can get for Easter there! We just got a new puppy and I need to make those tennis ball toys for him, so creative! What a brilliant and fun ideas! I'm glad that I found this cutest idea, my puppies will surely love it. I just discovered your blog and with this wonderful entry. I loved! and better than that, I'm sure that my 3 cats will love it too! Thank you!! Training your dog can be quite taxing and tiresome, best of but the pleasure you as the owner can derive from such an undertaking is great and very rewarding. past and present, choose the best aspects of a particular Poodle Mixes breed and try to match it to a certain job. There are some great ideas there, I would imagine that many of them are for the benefit of the owner as much as the pet.